Last week was a flood of bad news online, beginning with the ongoing confusion surrounding the crash of a Russian jet in the Sinai peninsula, and ending with two terrorists attacks. That’s right: two. One was in Beirut, the other Paris. Facebook went into overdrive, allowing people in Paris to post that they were ‘safe’ (and I did go and say thank God on each friend’s wall) and then adapt their profile photo to have the red, white, and blue of the French flag superimposed. No such options for the hundreds of people who were maimed in Beirut. Remember those off duty American airmen who saved that French train? Well, no such glory for father Adel Termos who reportedly tackled the bomber to the ground in the market, setting off the vest, saving lives, and sacrificing his and that of his young child. So the media has a bias. This we know. What we refuse to acknowledge is our complicity in this bias. Ratings are everything – even for the 24 hour news cycle. They still run advertisements after all. We must acknowledge that the bias in the media is the one we give it. The news reports on news that we want to know about. Here are three reasons why people want to know more about Paris than Beirut. 4. The Olympics of Suffering. If the stats say that 100 people died in one place (Paris) and 200+ people were maimed in another (Beirut) the economy of suffering says that Paris wins this round. As humans we are conditioned to shut out pain so that it doesn’t overwhelm us. In the modern age, with the suffering of the world at our fingertips, we shy away when we need to stay tuned. 3. The attack on Saturday resonated as a continuation of the story of the French (and the French way of life) being under attack. The coverage of the massacre at the magazine headquarters of Charlie Hebdo in January 2015 started that thread. We care about Paris because we already cared about Paris. That story was told with the subtext of freedom of speech as the unjust provocation for extremists. 2. Paris, like New York, and London, dominates popular culture in the movies, think Forget Paris, and books, of course, The Hunchback of Notre Dame. If you search in Amazon.com, there are 1,036,380 results for Paris across all the departments. Know how many there are for a similar search of Beirut? Under 10,000. Not kidding. Go try it. PS the French flag and “solidarite” have been the central image in the scrolling items bar at the top since the weekend. 1. People have been to Paris. Or dream to go to Paris. Or plan to visit Paris. 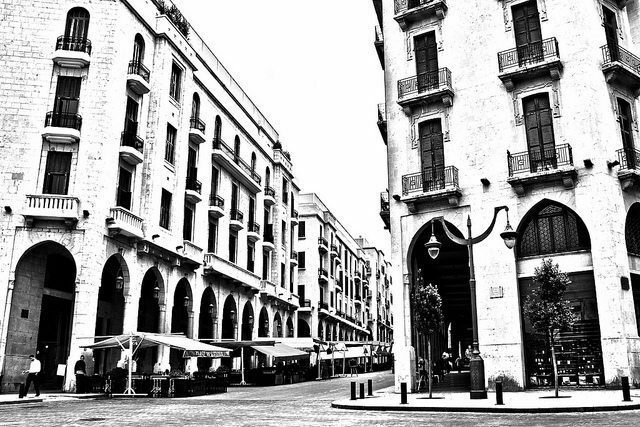 How many can say that of Beirut? The ease at which the media forgets about Beirut is equal to the difficulty we have in conceptualizing a place we have not been, thought about, or considered. Beirut exists for most outside the Arab world as a limited rendition of itself, concocted in Hollywood soundstages (love you, Homeland, but you went racial profiling rouge from Season 3). You can’t have empathy for people in a place you can’t imagine. I have been to Beirut. I’ve felt the pulse of a city that has survived 30 years of civil war and suffered through some of the most entrenched conflict in the world. The Lebanese love to party. They speak Arabic inflected by French rhythms (most of them speak French as well as English). Films like Caramel show you the beauty of Lebanese women. I have sat on the border between Syria and Lebanon waiting three hours in the visa office with an American passport in hand, and a cup of tea in the other. 30 years of war and plus (because the war did not end yet) and Lebanese were suffering from terrorism and the world was somehow indifferent. So why we are expecting from the world now to stand in solidarity with us! During all these years we did not wait for anyone to stand by our side. With so much pain we tried to stand on our feet so many times! Sometimes we failed, and few times we succeeded! But everyday, until now we keep trying! I wrote back, asking her to not give up on all of us. I had breakfast with a friend last week. Someone I’ve known yet not seen for years. We bumped into each other again picking up our children from sports camp. The years had changed us, we were now working mothers and we both had Syria on our minds. I spent the summer in Damascus learning Arabic in 2009. The friendly people, their patience with my half assembled phrases, the ancient nature of ruins like Palmyra: I loved Al Shams (the sun) as Syria is known. “My father sent us the paperwork for our property,” she said. “For safekeeping.” She described her father’s unwillingness to leave their home. 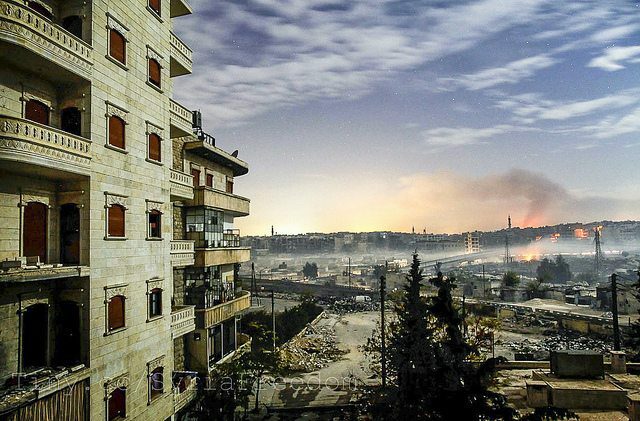 “The people of Aleppo spent their money on their houses rather than on airplane tickets. Whenever they had money, they would buy property in their city, following a very common adverb: ‘the money you don’t spend in your land is neither yours or your children’s’. As she spoke, her brown eyes dewy with worry about her father, the images of refugees being pulled from Hungarian trains or capsizing in the ocean on their way to Greece scrolled across my mind’s eye. “I told him, Daddy, you can forget about it. That is all paper.” She flapped an imaginary stack of contracts, flying away in the wind. Her voice rasped with the knowledge the final period of her father’s life was being spent in mortal danger, safeguarding the same property he had spent his youth garnering for her and her siblings. Which would we chose, forced with the option of uncertain life as a refugee, refused from most countries, or certain peril, a resident of the house you had worked so hard to provide for your family? 1. How many of your family members remain in Syria? My parents, grandmother and uncle are still there. 2. What keeps them there? My father is descended from a feudal family that lost most of its properties between Abdul el Nasser’s Agrarian Reform Law and the Syrian Baath reform (between the 70’s and 80’s). He refuses to leave the house even for a short vacation. He is scared of not being able to come back to Aleppo and getting stuck somewhere else as stranger. It’s as if his final duty is to guard the houses and lands he spent his life fighting for. My mom is more flexible. She would take the 10 hours of risky roads to reach the only international airport from where she can fly out her to meet us. The 2-3 month visits per year makes her strong enough to go back to fuel-lacking cold seasons and year round lack of electricity and water. My grandmother is a 90 something. She was out of Aleppo for 6 months in order to get medical treatment. As soon as she was able to handle the return journey, she made it back to home. She said she felt like her soul had been given back to her when she was surrounded by her belongings. My uncle is a pediatrician. He sent his kids to pursue their university studies in the US, accompanied by their mom. Very few doctors are left in Aleppo. This is how is managing to keep his private clinic open. 3. What do you want readers to know about the crisis in Syria? Syria is full of ambitious young people. She is a country of very good resources but with a repressive regime. I am not surprised at the amount of violence we see happening. How can we expect people who suffered of all kinds of humiliation, torture, and suppression, for 40 years, to fight the regime’s bullets as peaceful protestors or with yoga? They use the same language that has been taught to them. I really believe in education. Nothing can heal the ruined generation, but at least we can save the future one. 4. How can we help either those fleeing or those staying? The main help is to raise the voice to stop the WAR. Assad’s regime preys on innocent people.